Depending on your geographical location, fat biking can be something of a necessity, an optional activity, or a great mystery! One thing is for certain though: since its inception many years ago fat bike riding has proven to be a style of riding that’s going to stick around! 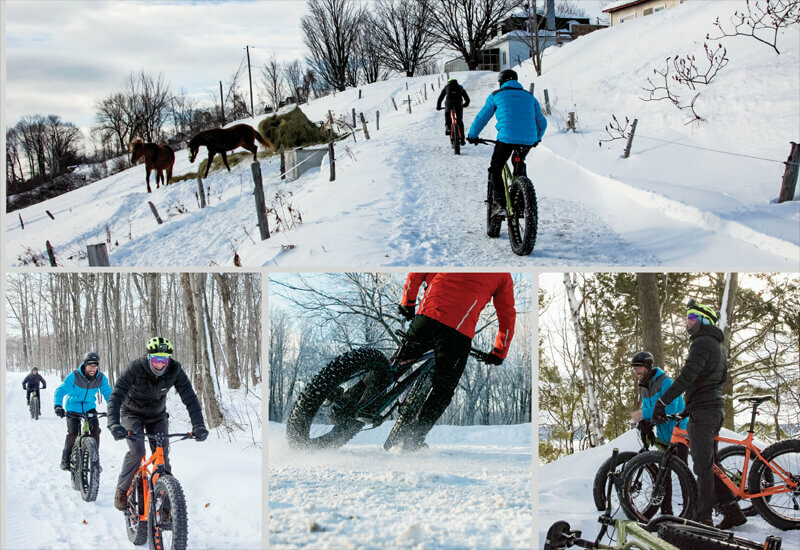 Whether it’s commuting in the snow, riding on the beaches, winter mountain biking, or reaping the benefits of wide tires, fat biking offers us everything from utilitarian purpose to all-out winter shred sessions. If you’re thinking about getting into the sport, be sure to check out the article that our friends at Bicyling.com put together. 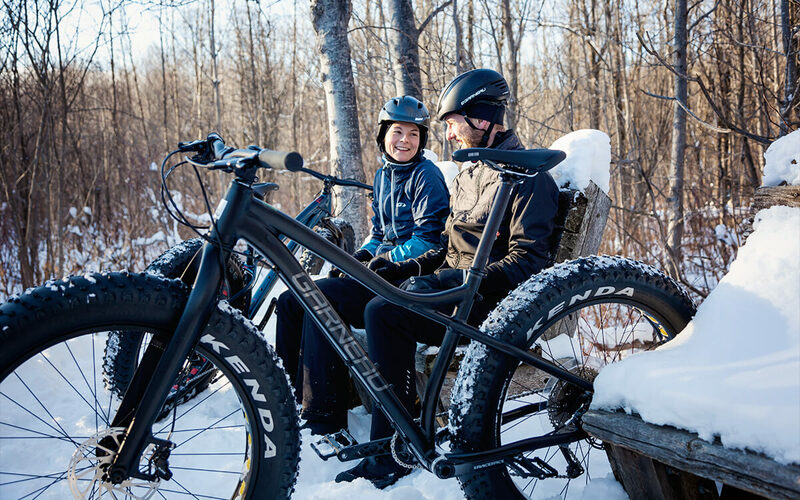 In this blog post, we’ll point you in the right direction when it comes to asking questions like what is a fat bike, why fat tires on bikes, what fat bike gear do I need and what to wear while winter fat biking. We’ll also give you some suggestions on Garneau bikes and kits for the most common conditions of winter fat biking. 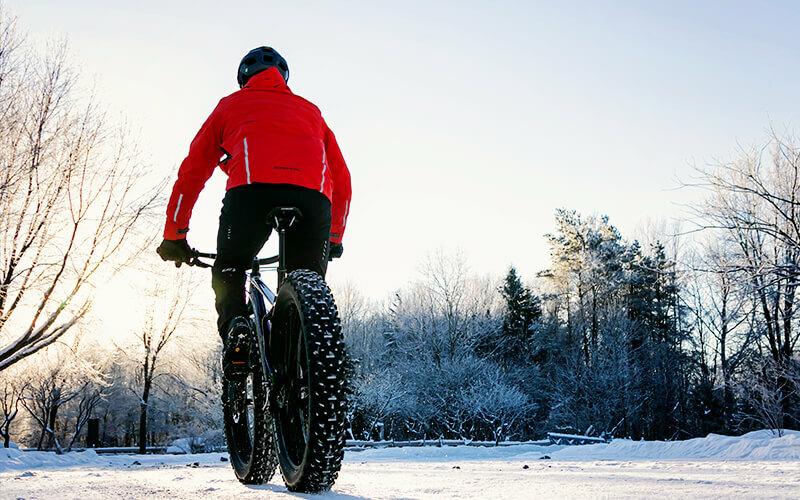 Embrace winter sport with Fat Bike. Fat biking got its name from the use of wide, or “fat”, tires. Traditional mountain bike tires are typically 2”-3” wide, where fat bike tires can range from 4”-6” or more. This originally came out of the need to have wider tires to get over varying loose terrain. 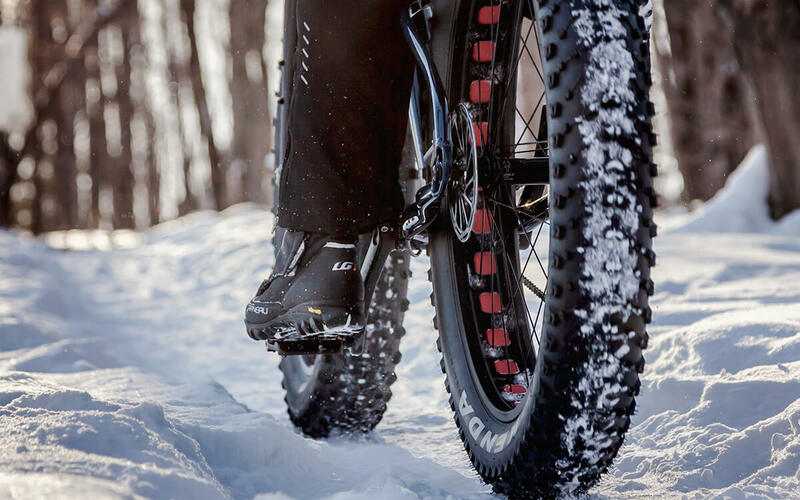 When riding in snow that’s not hardpacked or on sand, a traditional tire width of 2”-3” sinks into the ground and makes it nearly impossible to pedal. There was a need for cyclists who lived in these types of environments to create this evolution of the bike, thus enabling them to get around more efficiently. Oversize tires for oversized fun. Never get stop by the snow. Fat Bikes originally started showing up in Alaska and New Mexico in the late 70’s / early 80’s. For an in-depth history of Fat Biking, check out this great article from the Adventure Cycling Association. With the evolution of modern mountain bike geometry, fat biking has gained in popularity over the last 10 years. The older versions of fat bikes were cumbersome to turn, slow to move from edge to edge, and all out burley to handle. 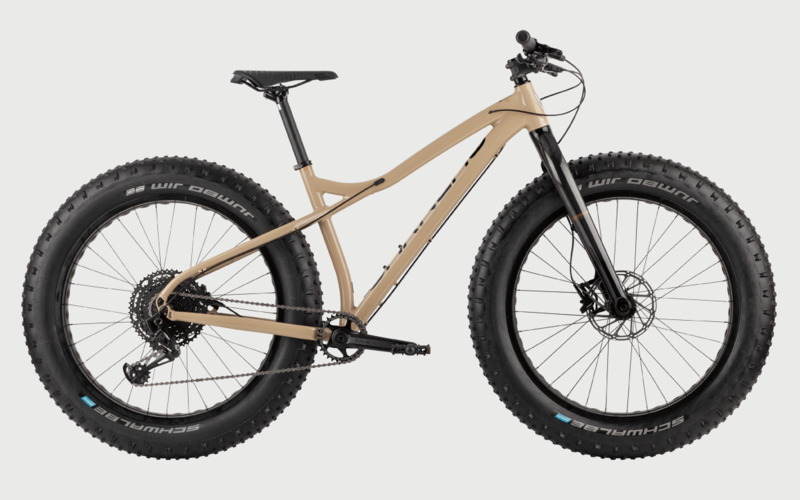 Today you’ll find Fat Bikes with tubeless tires, 1X drivetrains, shorter chainstays, slacker head tube angles, and longer top tubes. Simply put, this modern technology and design has created fat bikes that climb amazingly well, descend and corner with ease, are easy to ride, and are all out FUN to be on. This has enabled fatbiking to be experienced far past the snow and sand of its early days. Today it’s common to see fat bikes on regular mountain bike trails in the summer, on gravel rides, commuting, and pretty much anywhere regular bikes can be found. 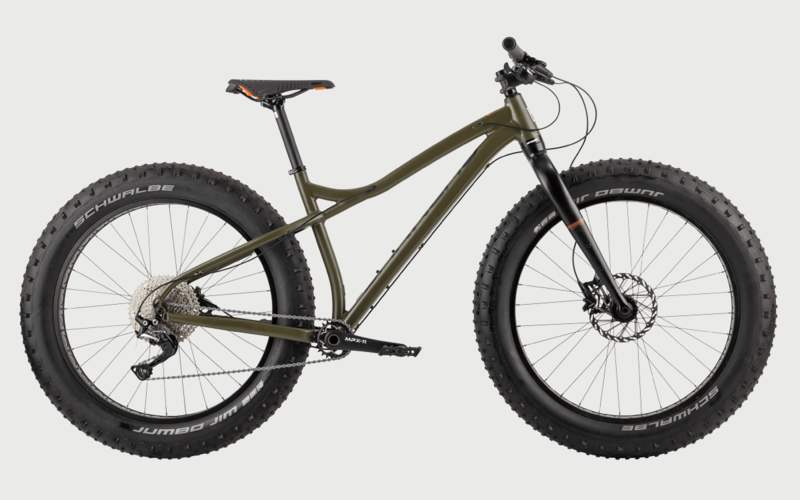 The ultimate in Fat Biking, and fully customizable through our Dream Factory custom bike program, the Gros Louis 0 is a top of the line, full carbon dream machine. Fast on the climbs, responsive on the descents, and confidence inspiring in the corners, the Gros Louis 0 rides like it’s on rails! The Gros Louis 0 has become a favorite amongst riders tackling the fabled Mount Belair Climbing event in Quebec and its lightweight and quick agility makes it the ultimate choice for the riders who appreciate top of the line craftmanship. The Gros Louis 1’s frame is made out of high strength and lightweight aluminum, and is paired with a carbon fork. This gives the bike great acceleration and handling capabilities while still providing comfort on the front end. Its component group is a step about the Gros Louis 2, which really only means it will last a lot longer and require less maintenance over the life of the bike. It also has the same modern features as the Gros Louis 2, just in the carbon offering. 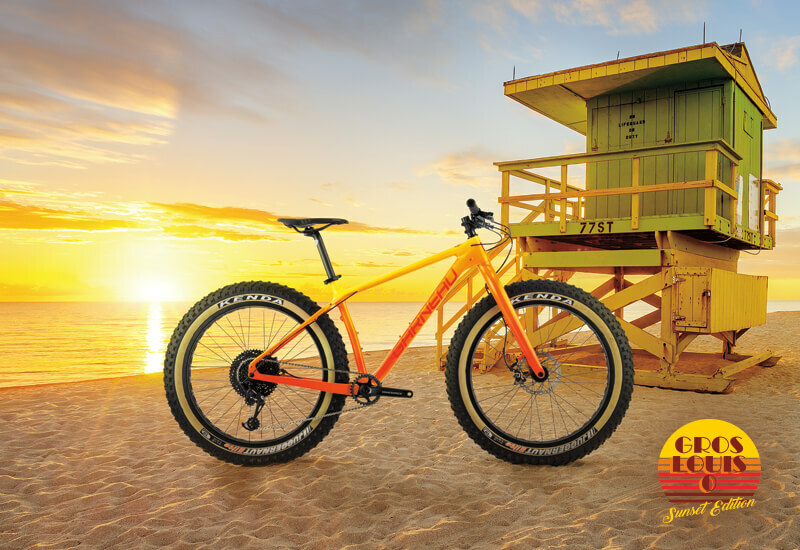 Gros Louis 2 is a great all-around fat bike that’s equipped with exactly the right gruppo to provide dependable performance. We make it for men, women, and children, so there’s something for everyone. It’s a great bike for recreational riding around the neighborhood, the local rails to trails, commuting, and generally having fun with no agenda. It’s made out of an aluminum frame and has all the features of modern fat bikes. 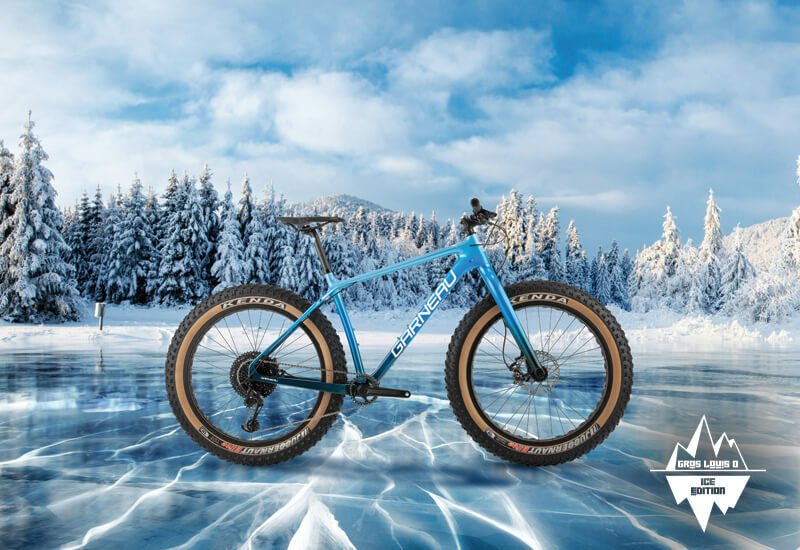 Features like front and rear thru-axles, tubeless compatible tires, dropper post routing, and disc brakes with DOT fluid that won’t freeze, makes this a great option to start with and upgrade as you get more serious. We get a lot of questions about what type of fat biking gear our riders should have with them, and what types of apparel cyclists should wear when riding fat bikes. Simply put, for the most part it’s the same types of gear you need for every other style of riding. At the end of the day it depends on the weather, where you’ll be riding, and how hard you plan on going. For summer riding you can wear regular road or mountain biking gear. It gets a little more complicated in winter, though. Singletracks.com put together a great article on how to dress for cold weather that is definitely worth the read. Dress appropriately to resist the cold. Our biggest tip for winter riding is covering all parts of your body and using a 3-4 piece layering system for your core. Keeping the core warm and dry should be your biggest priority. Doing this ensures the blood in your body stays warm and in turn your extremities will be happy! Also, be sure to cover your head with a cycling cap or a winter specific helmet. When covered up properly, 80% of your body’s heat will escape through the top of your head. Covering the head is perhaps one of the best things you can do to stay warm in the worst of conditions. As for Garneau specific gear, we promise we have gear that will protect you from the elements and enable you to ride no matter the conditions. We’ve spent the last 35 years riding in the frigid cold of Quebec winters, and our products have kept us warm time and time again. From bikes, to helmets, footwear and apparel, we can kit you out in all the fat bike gear you need. Due to the areas that fat bikes are ridden, we typically recommend an SPD style mountain biking pedal to be used with Garneau MTB shoes. Being clipped in helps with pedaling efficiency in snow and sandy areas and really helps you get where you’re going with more ease. However, if you’re just getting into fat biking, using your regular winter boots and a set of flat pedals also works just fine. We’ve spent some time developing winter specific fat bike shoes. These are great for the rider who is out a lot over the winter, and who doesn’t let the cold weather stop them. Typically speaking, these shoes are perfect for conditions under 0 degrees Celsius, or 32 degrees Fahrenheit. The Klondike shoes feature a Vibram outsole that offers superior traction in wet conditions. It also has an amazing retention system that uses the combination of hook and loop closures and a boa dial to keep the foot warm and secure. It's made out of a Cordura 1680 D material with 400 grams of Thinsulate insulation. That means your feet are going to stay warm and dry no matter what! Our all new Mudstone shoes offer full wind and water protection in a slightly lighter weight option. 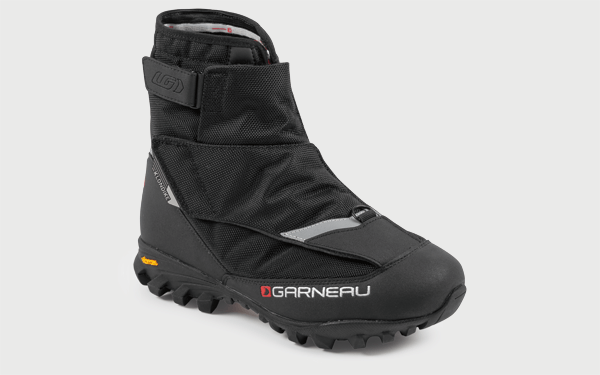 With a 200 gram insulation, IP1 boa dial closures system, and fully waterproof upper and outsole, it’s a great option for cold temperatures. It also has a high-volume fitting last, which means you can wear thicker socks with it. Any style of helmet that you would typically wear for cycling typically work for fat biking. The key here is warmth. If you’re using your own standard cycling helmet, just be sure to cover up your head. 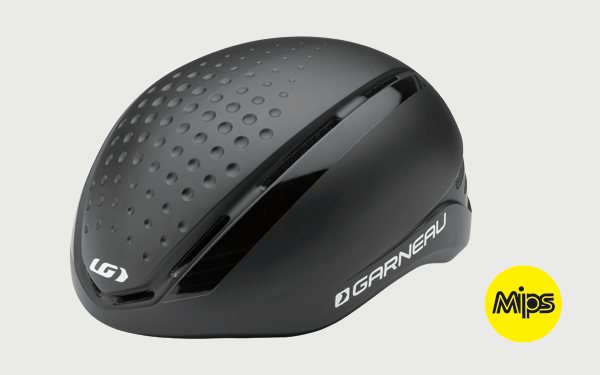 At Garneau, we really like the Vitesse Cycling Helmet. It has a bit more coverage than other cycling helmets which makes it perfect for the coolest day. When it comes to layering, we’re huge fans of a 3-4 layer system on the torso, especially if one of those layers can be removed and packed into a pocket or saddlebag if you over dress. With the right combinations of baselayers, jerseys, and outer shells, there really isn’t a foul weather condition you can’t go in to. The biggest rule is to never wear cotton. These are perhaps the most important layer. Baselayers go against the skin, absorb sweat and moisture emitted from the skin during physical activity, and move it to the next layer of clothing to be spread out. The 2004 base layers is perfect to keep you dry all winter, perfect to keep you warm. Our 2004 Baselayer System is a great option to cover both the torso and the legs for those super cold days on the saddle. We have plenty of other baselayers as well and depending on your preference you may choose to mix and match baselayers as you see fit. Our jerseys are typically made out of three different thicknesses: Lightweight, midweight, and heavyweight. This is where personal preference and outside temperature really come into play. If you think you’ll be riding super hard then a light to mid weight jersey could be good for you, especially if you plan on having a jacket on. If it’s super cold and you’re going easy, try out a mid or heavyweight jersey. Some people also use jerseys as a second and third layer by putting a lightweight jersey on first, followed by a mid to heavyweight jersey. This is totally up to you but try not to keep it at three layers total, and a fourth if it’s super cold outside. Any more than four and you’ll have a hard time moving around. Lightweight Jerseys: Our Men’s Lemmon and Women’s Beeze long sleeve jerseys are a great option for a lightweight long sleeve jersey. Midweight Jerseys: Step it up a notch with Men’s Edge 2 and Women’s Edge 2 jersey. Heavyweight Jerseys: Our Men’s Thermal Pro and Women’s Thermal Pro jerseys are our heaviest weight jerseys and provide plenty of warmth for the coldest days. We offer 10 men’s jackets and 8 women’s jackets in the Garneau line, which means we have a jacket for almost every micro-climate. Some jackets on the market are highly breathable but not very wind and water proof, while others are heavily wind and water proof, but not very breathable. We’ve spent years developing fabrics that give you the best of both worlds! We offer jackets that both protect you from wind, water, and cold, yet are still super breathable and lets the moisture from your body escape through the outer layers. A well made, well-fitting jacket that provides the right balance of heat retention and moisture wicking. For a great outer shell that’s lightweight and fully wind and waterproof, our Unisex 4-Seasons Jacket is a great option. Since it’s a shell it doesn’t offer insulation, so it’s a great piece to use layers underneath, but it will protect you in the worst of conditions! 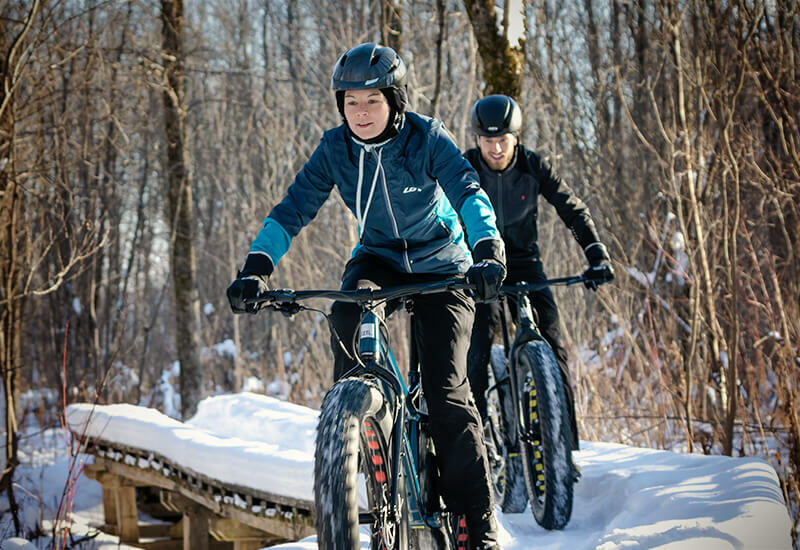 Our Men’s LT Enerblock Jacket and Women’s LT Enerblock Jacket have been a great option for fat biking as well. It’s a softshell material so it provides insulation as well as moderate protection from the elements. If you’re going really hard, and if it’s not super cold outside, our Men’s Glaze Jacket and Women’s Glaze Jackets are a really cool option as well. They’re a hybrid of a jersey and a jacket, provide some insulation and have a wind proof front panel to keep the cold and wind out. For the ultimate protection from the wind and cold, our Men’s Course Elite Bib Tights and Women’s Course Elite 2 bib tights get the job done! Thermal brushed back fabrics, articulated knees, and windproof panels are just a few of the features that keep you rolling in the cold. Our Unisex Torrent Pants are also a great outer pant shell that you can throw in for seriously wet and cold conditions, though they don’t have a chamois liner, so don’t wear them alone. For moderate conditions, try out the Men’s Providence Cycling Bib Tights and Women’s Providence Cycling Bib Tights, available with or without a chamois. We’ll talk about shoes next, but if you’re wearing the same shoes for winter riding as you do in the summer, you’ll definitely need a shoecover to go over your shoes. It’s a great option for anyone who doesn’t need extra sets of shoes and is happy with what they have. Our Neo Protect 3 shoe covers are our ultimate in winter fat biking accessories. 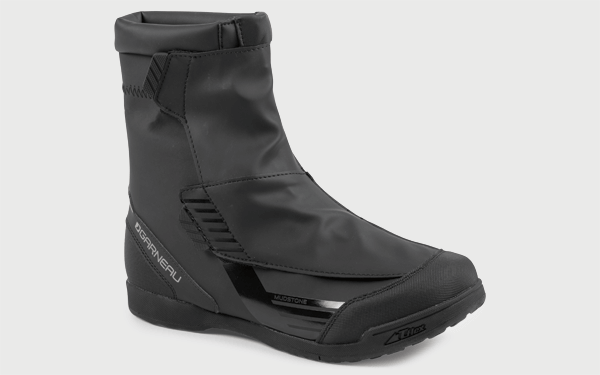 They go on easy, are designed to be worn with MTB or SPD style shoes and are super warm. If you’re looking for something a bit lighter, then try out the Wind Dry II Shoes covers. They’re perfect for conditions above 5 degrees Celsius, or 41 degrees Fahrenheit. 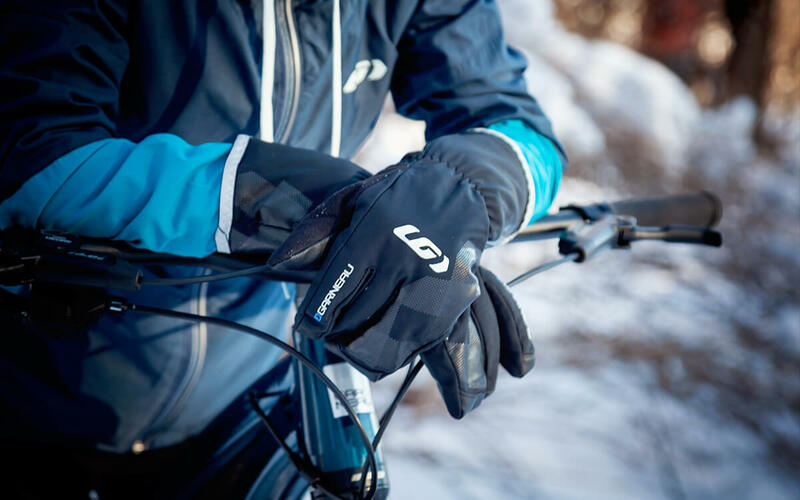 Similar to headwear, the type of glove you wear depends on how hard you’re riding and how cold it is outside. A lot of people’s hands get very cold, while others stay very warm. Try a few things out, and always tuck a second pair of liner gloves in your jersey pocket in case you need to double up. 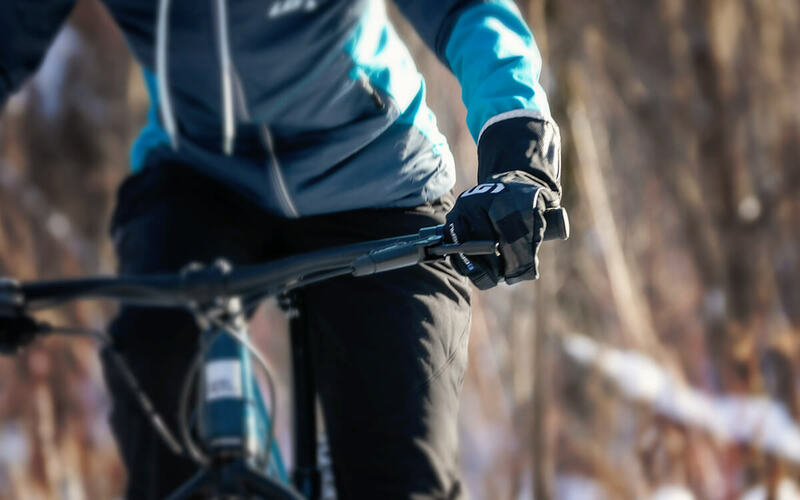 Bigwill Gloves is designed to perform in cold weather. The Bigwill is our most heavy-duty glove, designed for the coldest of conditions. It’s also a great piece to have if you’re not riding hard, as the Polartec fabric it’s made of is our warmest materials and will keep you toasty when it’s frigid outside. If you’re stepping up the pace a little, or not riding in freezing temperatures, our fully waterproof Shield + glove is a great option. It offers both primaloft and WindDry materials in its construction and excels in snowy and wet conditions. If you’re looking for an early fall or late spring glove, the Proof is a great option. It’s waterproof, windproof, and uses 3M Thinsulate materials to keep the blood flowing. As mentioned earlier, it’s always a great idea to pack a lightweight liner glove. They really, really help when you realize it’s colder outside than you thought it’d be. Our Tap Glove is a great liner glove and will even stand alone on those cool early mornings when you just need one small layer. As we mentioned earlier, it’s super critical to cover your head in the winter. If you’re wearing your own helmet, our Winter cap and Waterproof cap offer head and ear coverage that fits under your helmet and covers your head as well as your ears. We highly recommend covering your ears whenever possible. Great offering for the winter accessory. 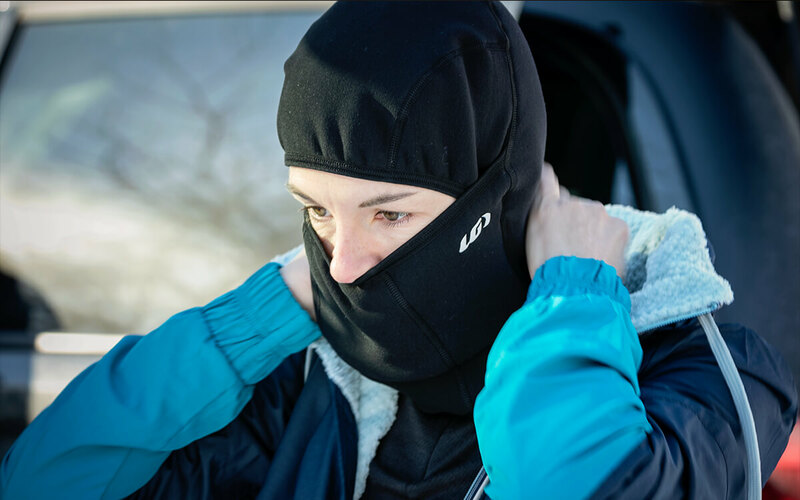 If you’re looking for full coverage, the Matrix 2.0 Balaclava provides head, ear, neck and face coverage, and fits under your helmet with ease. If you’re trying to mix and match, check out our Wind Headband, Winter Skull Cap and Matrix 2.0 Neck Balaclava. We also have headwear like our Hugo Headband that offers a wide band that can cover your ears and forehead, leaving just a small opening on the top for heat to escape. This type of coverage is great for higher aerobic activities where you’re working super hard and don’t want to overheat. When it’s super cold out, we’re big fans of doubling up our socks. We like to stick with wool, and put on a lightweight, thin sock first, and then add a medium to heavy duty sock on the outside. This all depends on your personal preference, and what types of shoes and/or shoe covers you plan on wearing. Test this out in advance and know your body’s preferences. For a thin sock we love the Merino Prima socks, and if we need to beef it up, we’ll add the Merino 60’s on top. Let's get «Fat» and ride! We hope this article helps you narrow down your fat bike apparel and gear options. We love the sport of fat biking and hope you’re able to get out and enjoy it as well.